Elegant Engagements Wedding and Event Planners: Cinco de Mayo! I wanted to pass on a great idea I read on the Hostess with the Mostess Blog. 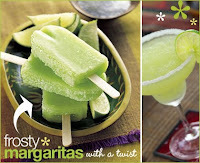 Margarita Ice Pops - she has a great recipe on there. Enjoy today or save for a Hot July evening!